Mark William Calaway famous by his ring name The Undertaker is an American professional wrestler born on 24th March 1965. He began his wrestling career in 1984 for World Class Championship Wrestling with the ring name of Texas Red. In 1989, Mark William connected with World Championship Wrestling under the ring name Mean Mark Callous. Here he wrestled tag team and single competitions and finally a year later Calaway signed with the World Wrestling Federation (WWF) from where he received ultimate success. His debut under WWF was with the ring name of Kane the Undertaker at survivor series. The Undertaker’s successful career began by defeating WWF/E Champion Hulk Hogan in 1991. After this victory he never turned back and earned worldwide fame with numerous victories in WWE including The Streak, WrestleMania, WWE Championship and World Heavyweight Championship. The Undertaker is as well the winner of the USWA Unified World Heavyweight Championship and 2007 Royal Rumble. He is still with the WWE which made him the company’s longest tenured wrestler. In addition to that, Calaway appeared in different television shows and films such as Suburban Commando, Celebrity Deathmatch and Beyond the Mat. In his personal life, The Undertaker got married to Jodi Lynn in 1989 and the couple had a son together but they separated in 1999. After that, he married to Sara a year later and they had two daughters together but in 2007 the couple divorced. In 2010, Calaway married to Michelle McCool and they have one child together. Listed below are the complete WWE wrestler The Undertaker body measurements including his height, weight, chest, biceps, waist and shoe size. Mark Calaway is also a black belt Martial Artist. The Undertaker is a huge fan of mixed martial arts and boxing. 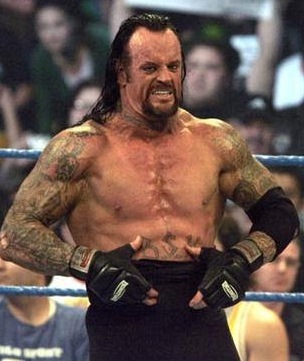 He has numerous nicknames such as The Deadman, The Lord of Darkness and The Phenom. U r looking sooo gud sir…. Please 1 call me Undertaker. I am 17 year old. I am 8 year old big fan (UNDERTAKER). 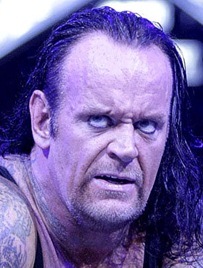 I am big fan of you undertaker .you are the god father in wwe . And all superstar if your students. 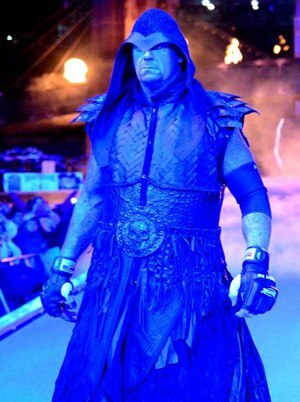 Undertaker you are the future of wwe I love undertaker you are my best fighter. Brock Lesnar is a steroid using giant with a massive ego and attitude. Sheamus just wants to pick fights and is just a giant bully. Seth Rollins is full of himself, Dean Ambrose needs mental help, Kane can’t decide whether he wants to treat every day like Halloween or be normal.